Wireless sensor networks (WSNs) transmit sensor data and control signals over long distances without the need for expensive infrastructure. They are relatively low-cost and can provide real-time information from a variety of soil moisture and environmental sensors. Growers can make timely irrigation and fertilization decisions based on the feedback they get from these WSNs. Having this real-time monitoring capability can have major benefits, not only on reducing water and nutrient use, but also pest and disease management decisions based on on-farm microclimatic information. All in all, WSNs can have substantial benefits and add value to existing practices by helping growers make timely decisions, to improve the efficiency of daily management decisions. An illustration of farm-scale WSN (from Lea-Cox, 2012). Robust and durable Nodes and sensors can be deployed in the field and provide continuous and dependable data for a number of years with minimal maintenance. Maintenance (1-2 times per year) is required usually to change batteries, troubleshoot non-working sensors and to restart the system after power outages. 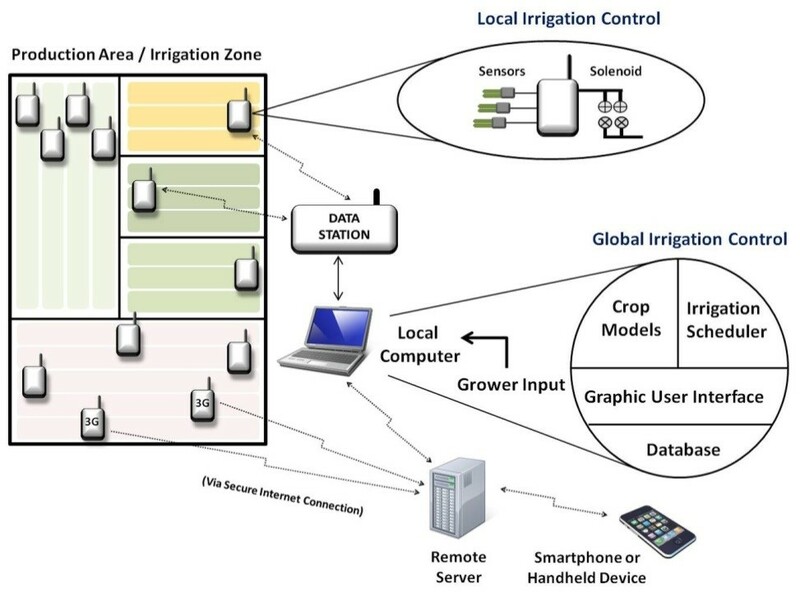 Wireless nodes (Em50R and nR5, Decagon Devices, Inc., Pullman, WA) collect data from a variety of soil moisture and environmental sensors deployed in production areas on the farm (pictured in the graphic above). Up to five different sensors can be attached on a single node. The wireless radio nodes log data from the sensors at a time interval specified by the grower (typically 1-15 minutes). These nodes are powered by five ‘AA’ batteries, with an average life of at least 6 months (and up to 9 months with higher measurement intervals). 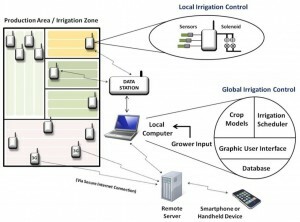 All accumulated data is then transmitted from each sensor node (using a 900 MHz radio card) to a ‘base station’ receiver which is connected to a personal computer on the farm. With Em50G nodes, data is transmitted directly to a cloud server, using a 3G wireless SIM card. The logged data is then accessed from the server via a website. In this way, a grower can install and develop a cost-effective, scalable network of sensors that allows for the monitoring of soil moisture and environmental data in real time. The incoming data is collected and stored in a software database called “Sensorweb™” (Mayim, LLC., Pittsburgh, PA). The Sensorweb interface graphically displays the downloaded sensor information for the desired period of time. Data coming from each node is organized into the database, and graphically displayed very easily at various time scales, depending on what question the grower/ user is wanting to answer (e.g. what was the trend for the soil moisture status for the past 7 days in a particular block or plant species). Among the important features of the user interface Sensorweb is its capacity to generate additional valuable information from the sensor data. For example, ecologically important information such as growing degree-days (used for integrated pest management), chilling hours (for prediction of bud development and flowering prediction), daily light integral (total amount of light accumulated per day), reference and crop evapotranspiration (ET) can be generated using the growing tools feature in Sensorweb. Another very important feature is the ability to send automatic text or email alerts to managers, when sensors are out of ranges set by the grower. For example, frost alerts will be sent based on leaf temperatures in the canopy when the temperature reaches say 35F, in time for the grower to turn on his irrigation frost protection. Nodes can be placed in those production areas that are most frost-prone, based on the grower’s previous experience. Although installation and maintenance of WSNs can be performed by the grower, there are a number of ways that a grower would benefit from someone who has completed a number of different installations. A consultant/distributor can help with issues such as which sensor to purchase for your situation, how many sensors/nodes to purchase, where to place sensors based on topography and how deep to place them in the soil, troubleshooting connectivity issues etc. Once the WSN is set up, the consultant/distributor should show you how to use the information they provide. Additional services may be available depending on the consultant. Maintenance for WSNs include such activities as changing batteries for nodes (where applicable), updating software in the base station and nodes, and troubleshooting other network issues as needed (for example, when sensors get pulled out, stop working, etc.). Some or all of these services can also be performed by a consultant, if you so choose.